This morning I awoke from my slumber with the bed curtains around me, I felt I was Khaleesi from the popular television series Game of Thrones as the setting in which I woke made me feel I was from that era. Today is officially day 1 in Paris as yesterday was really a half day by the time the boyfriend (Sean) and I actually found our amazing cubby house apartment. First stop today was Starbucks Coffee as they offer free wifi which allowed us to google things to do in Paris. Before we headed out to the main attractions of Paris we first needed to fuel our body, we walked around looking at menu’s out the front of the many café’s but had no idea what they said. I could make out omelet and salad but I was not 100% sure of the additional ingredients. 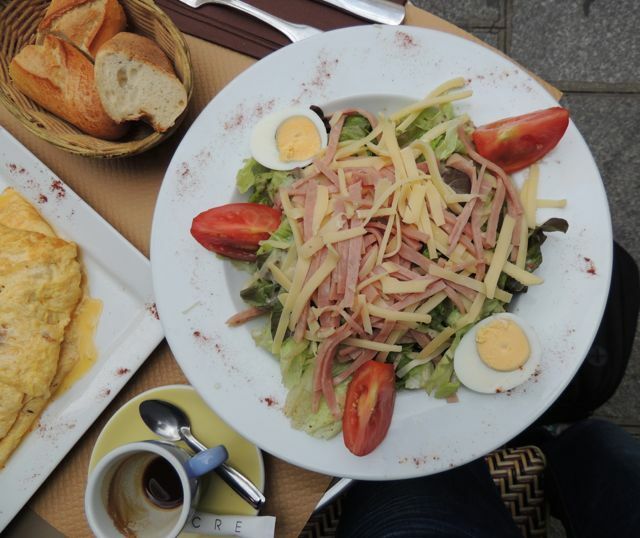 I remembered somewhere a while back that jambon was French for ham and I was pretty confident that fromage was cheese so I ordered the “jambon fromage salad” and Sean ordered the same combination of omelet. It was not worthy of the QCA, (Quirky Calorie Approval tick) but was probably the healthiest thing on the menu. After lunch we decided we would get on the Paris double decker bus tour like we did in London, it was 3pm by the time we got around to this and we were advised if we waited another hour our ticket would be valid until 7pm the next day. This was fine as like London, Paris also had bikes to hire..
We figured we could fill in the time by cycling around Paris prior to our bus tour but we did not anticipate getting lost. 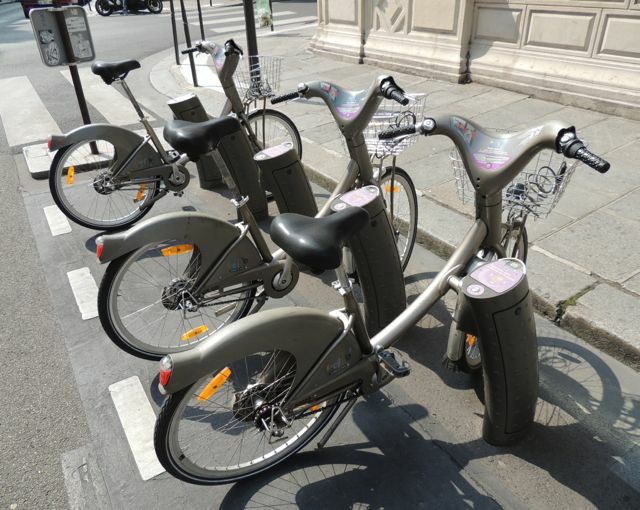 We cycled up and down Paris streets and saw some beautiful buildings along the way. Once we realized we were lost I left it up to Sean to get us back to where we needed to go as reading maps is not a strong point of mine. 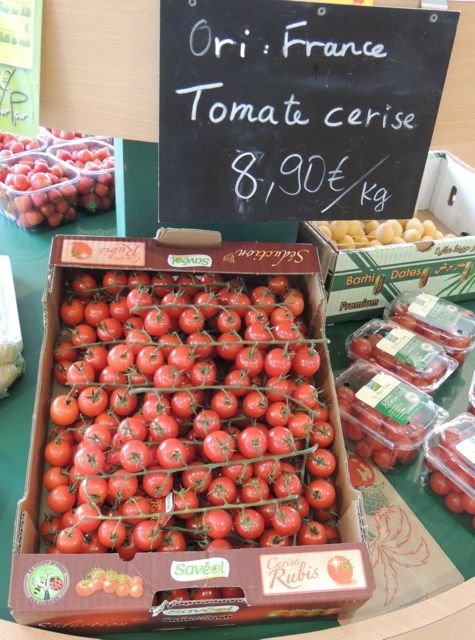 We stopped at a fruit shop to get some water which gave me a chance to view some of Paris’s fresh produce.. There is something about the scent of fresh fruit that puts me on a quirky high!! 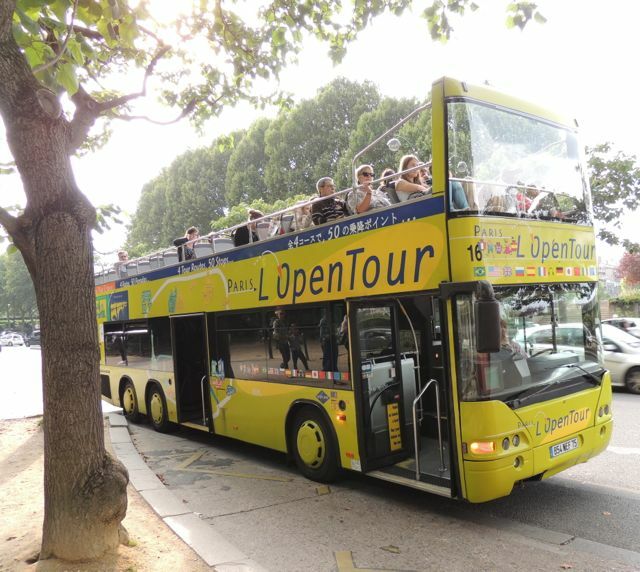 We eventually made it to the tour bus pick up point and started our Paris tour journey. Paris is a beautiful city with so much history. Sean and I decided we would get off the tour bus at the Eiffel Tower, there were people everywhere taking pictures and we were no different. However half way between our snaps the battery on our Nikon Coolpix camera died, I could not believe it… We are in Paris the most romantic city in the world and our camera battery needs charging, luckily I had a canon point and shoot compact camera but the picture quality just wasn’t the same. Sean thought it would be funny to jump in front of the Eiffel Tower and his pictures looked amazing. However I sustained a “Quirky injury mishap” when I tried to jump.. My jumps looked more like I was about to dive in to a pool and as a result my right ankle that I had heavily sprained twice in the last 2 years became injured, the fact I was jumping in thongs (flip flops) probably didn’t help! I had a chuckle to myself, as I am extremely uncoordinated, I then hobbled to get the bus to our next destination. Our next stop was a very expensive looking location in Paris, I was now quite hungry so happy to get off the bus. 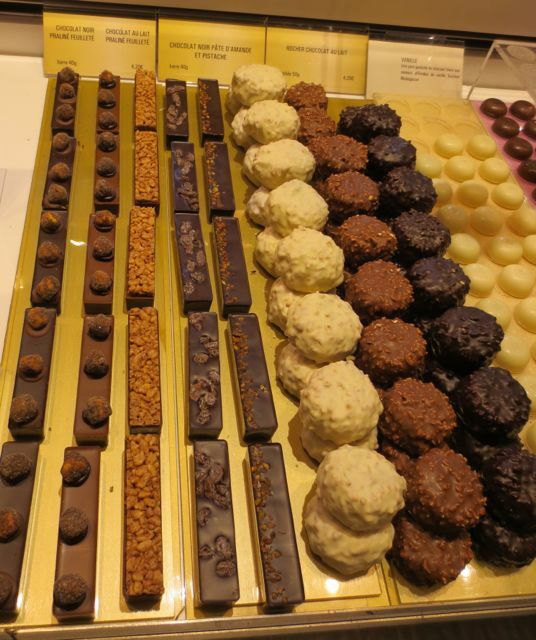 There are so many chocolate shops in Paris, it is absolutely amazing!! The chocolate shop we went in to had very serious security looking men inside which was a little off-putting. We bought 2 x praline bars, one hazelnut and the other pistachio both were delicious but together these cost close to 10 euros, at that price I was expecting the praline to be pieces of gold not nuts. By the time we made it back to the Hotel De Ville which is not a hotel name but the suburb in which we are staying in Paris, it was time for dinner. 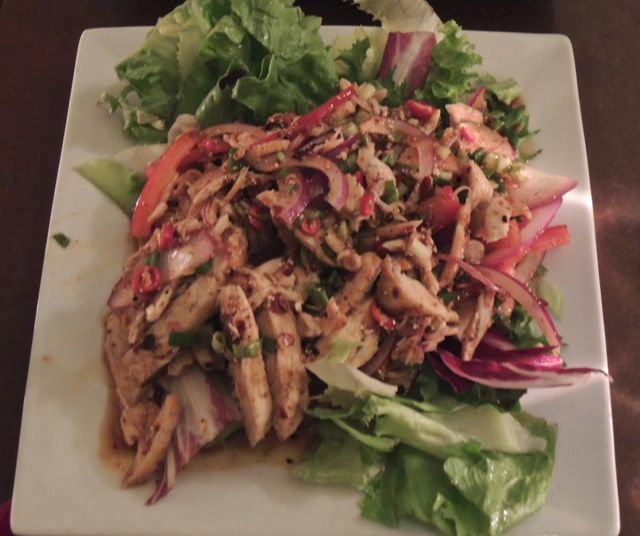 Last nights meal was just too rich for both Sean and I, we were craving a chilli hit and as ridiculous as it sounds we decided on Thai for dinner. 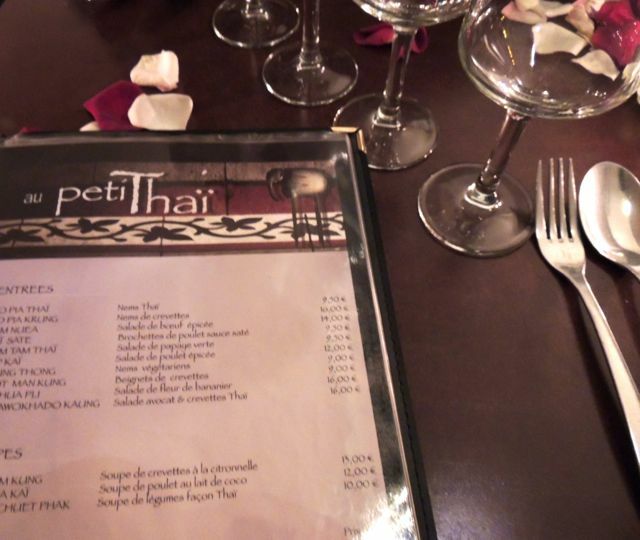 Yes we ate Thai in Paris, crazy!! We had a Spanish waiter that spoke Spanish and French but only a small amount of English. We tried to tell him we wanted spicy food with no coconut milk, this was quite a challenge but he was so friendly and patient with us and eventually we had finalized our order. We also shared a bottle of French white wine. At 100 Euros, this meal was by far the most expensive Thai food we had ever ordered and we didn’t rate it very high although the service was outstanding. Tonight we thought we would sample a different gelato store as there is always a line out the front. Again we had no clue of the flavours so we watched as people ordered before us and the lovely man that worked in the ice cream shop called out the various flavours as he put them in the cone. 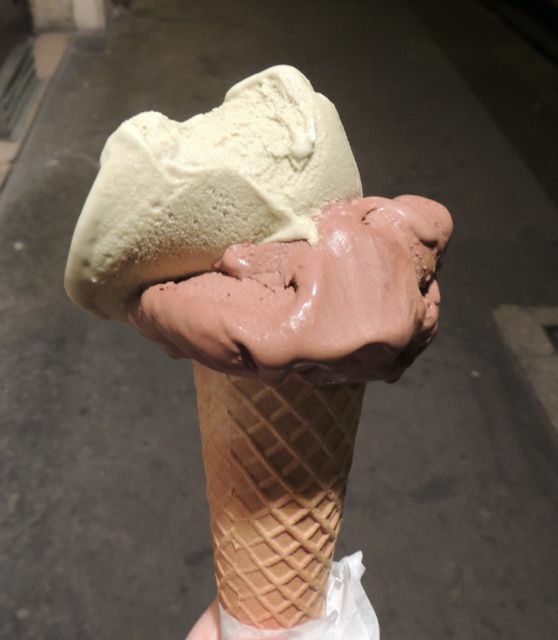 Upon recommendation we decided on one scoop of chocolate hazelnut and one scoop of pistachio, YUM!! Even the cone was delicious with a rather unique texture!! 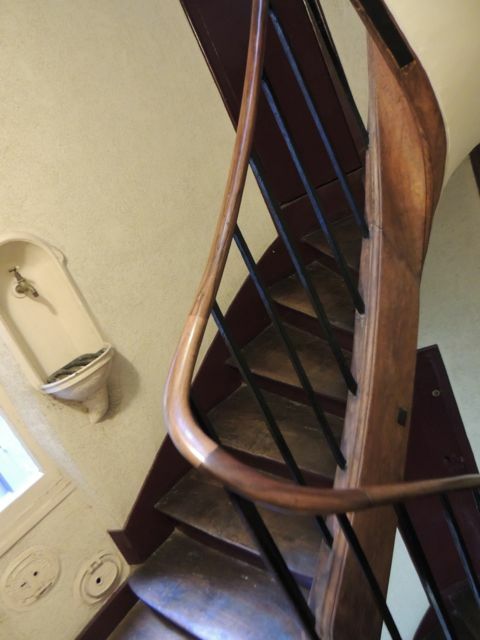 Luckily I have 105 stairs to walk up to burn some of the quirky calories I am consuming in Paris!